The Inca Trail is Peru's best known hike, combining a stunning combination of Inca ruins, magnificent mountains and exotic vegetation. The trail goes over high mountain passes with unforgettable views, through the rainforest, and finally into sub tropical vegetation.The legendary Inca Trail takes you through the diverse wilderness of the Machu Picchu Historical Sanctuary, passing numerous Inca ruins on the magnificent stone highway before descending to the famed citadel of Machu Picchu. The 45 km trek is covered in 4 days, arriving at Machu Picchu at daybreak on the final day before returning to Cusco by trainin the afternoon. The trek is rated moderate and any reasonably fit person will be able to cover the route. It is fairly challenging nevertheless, you will be carrying your own personal equipment (porters carry group equipment including tents, stoves and food etc...) and altitudes of 4200m arereached. We allow 2 full days in Cusco prior to commencing the trek in order to help you acclimatize sufficiently and give you an opportunity to visit the city of Cusco and near by Inka ruins at Sacsayhuaman, Q'enko, Pucapucara and Tambomachay. Your trip departs from London Heathrow where you’llfly to Lima (Peru’s Capital City) and onward to Cusco (about an hour flight). The El Balcon Hotel or similar (3/4 star) will be your base for the next few days whileyou acclimatise to Peru’s high altitude and prepare forthe Inca trek ahead. 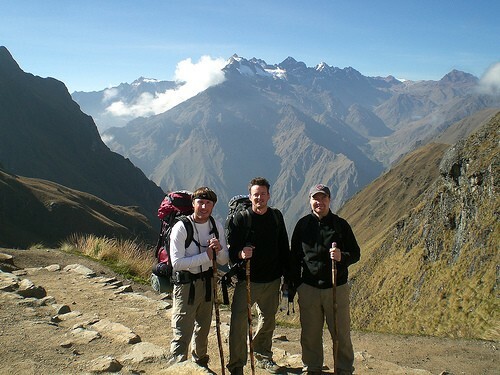 The 4 day trek is lead by an English speaking professional guide and takes you along the magnificent Inca trail. The trail undulates through high mountain passes with spectacular views of Peru’s beautiful landscape and historic sites. 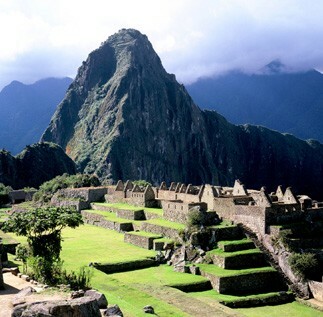 You then arrive at the ruins of the Machu Picchu’s Historical Sanctuary at day break giving you a full day to explore. You’ll then be transfer back to your base at the El Balcon Hotel in Cusco for a good nights rest. You have two full days in Cusco where you can simply relax and enjoy the city of Cusco. How ever some travellers opt for a days rafting or a jungle tour (not included in the trip cost but we are more than happy to arrange any extra excursions for you). On the final day you be transferred to Cusco airport and fly back to Lima and on to London Heathrow. Day 1 - Meet your group and fly from London Heathrow Airport to Lima/Bogota. Day 2 – Onward flight to Cusco - the centre of the ancient Inca empire. When you land you then transfer to your hotel to enjoy the area and acclimatise to the altitude of 3400m. Day 3 - The day is free to enjoy Cusco and acclimatise and to prepare kit for the trek ahead. Overnight bed andbreakfast hotel accommodation. Day 4 – A second full day in Cusco to acclimatise to thealtitude. In the evening there is a meeting with the our guide to run through the trip and answer an specific questions. Our Guides will pick you up from the hotel in Cusco at 4:30AM. We will then drive to Km 82, arriving at about 7:00AM. After a delicious breakfast prepared by your cook, we’ll go throughthe first Inca Trail check point to begin our trek (please make sure you have your original passport with you to enter the Inca Trail). 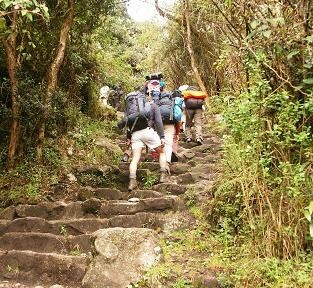 The first 2 hours of the trek are relatively easy aswe make our way to our first Inca site, Patallacta which is an ancient Inca check point for theapproach to Machu Picchu. From Patallacta it’s another 2 hour hike to our lunch stop. After lunch we will hike for another 21⁄2 hours until we reach the first night’s campsite at Ayapata(3300 meters). We’ll arrive to our campsite by 5:00PM and after settling in you can relax and have a hot drink and snack with your team of porters, chef and guide. By 7:30PM your dinner will be ready, and afterwards you can get some well-deserved rest. Your porters will wake you up early with a hot cup of coca tea to get you ready for the day. Today is our longest day and we will start early. We’ll hike for roughly 4 hours to the highest pass of the trek, Dead Woman’s Pass (4215 meters/13829 feet). On reaching the pass we’ll stop for a short break to enjoy the views beforesetting off again to descend to the next valley(Pacaymayu Valley – Hidden River). It’s another hourand a half down the side of the valley to our lunch spotand a chance to refill our water bottles. After lunch webegin ascending again to the second pass of the trek.It’s 2 hours to the pass and along the way we’ll stop at a small Inca site (Runcu Raccay) and see two huge waterfalls cascading down the opposite side of thevalley. After the second pass, it’s another hour down hill hike to reach the magnificent Inca site, Sayacmarca (anotherwise inaccessible village). We’ll stop here for a rest and have a quick tour of the site and then watch the sunset over theVilcabamba mountain range. It’s then just another 20 minutes until we stop for the night at our second campsite Chaquicocha (Dry Lake, 3600 meters). After dinner, if you’re not too exhausted, we can do some star gazing and we’ll point out the fascinating Inca constellations.In the magnificent Southern Hemisphere sky, away from all the artificial lighting, this sky is something to behold! Completing Day 2 and beginning Day 3 certainly deserves a pat on the back! We begin earlyagain, waking up at 6:30am to begin what is commonly felt to be the most beautiful day of the whole Inca Trail. We hike for 2 hours along what we like to call “Inca flat” (gradual inclines)and begin to enter the jungle, known as the Cloud Forest. As we walk we will have the opportunity to see the majesty of Salkantay, the second highest snow-capped mountain in theSacred Valley, and a fantastic panoramic view of the Vilcabamba mountain range. Towards the end of the Inca flats we begin to make our way up to the last peak at Phuyupatamarka(3600 meters) from where we’ll have great views overlooking the Urubamba River. Down the valley we get our first views of Machu Picchu Mountain but the site itself is still hidden from view. From Phuyupatamarka it ́s a 3 hour walk down a flight of steps to our last campsite,close to Wiñay Wayna (Forever Young). Wiñay Wayna is the most spectacular Inca site on the trail after Machu Picchu and the most popular campsite because of its proximity to MachuPicchu. 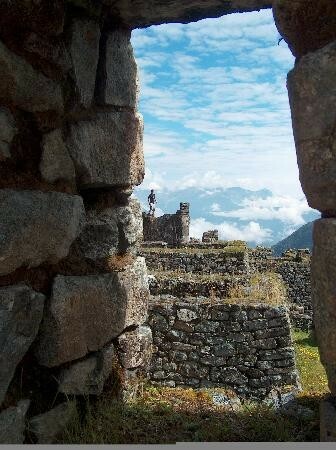 During the descent we visit 2 Inca ruins, Phuyupatamarka (Town in the Clouds) and Intipata (Terraces of the Sun). We arrive at our campsite around 1:00PM to have lunch and then relaxfor the entire afternoon so that you’re relaxed and ready for your final day at Machu Picchu. Ataround 4:30PM your guide will give you a short orientation and you will visit the Inca ruins of Wiñay Wayna, spending about an hour and a half there. We will explain the significance ofthe site and combine all the information given during the trek so you’re fully prepared for your visit to Machu Picchu the following day. We like to spoil our guests as we enjoy our last feast with the porters and chefs. It’s an IncaTrail tradition to organize a ceremony in the evening to introduce the team to the tourists onceagain and to thank them for the great job done It is advisable to go to bed at a reasonable time in order to get up in the early hours of the morning to arrive to Machu Picchu at the crack of dawn in the hopes that the weather will give us a beautiful sunrise over the ruins at MachuPicchu. Considered: Easy day – all downhill! Weather: Hot and very humid (lots of water needed). For our August 2019 trip we are offering the self funded payment structure. The cost of the trip is £2,350. There is a £250 trip deposit (non-refundable) to book your place and the remaining balance is paid in instalments. Due to high flight costs and the limited availability of trekking permits the bulk of the instalments must be paid before Christmas 2018. 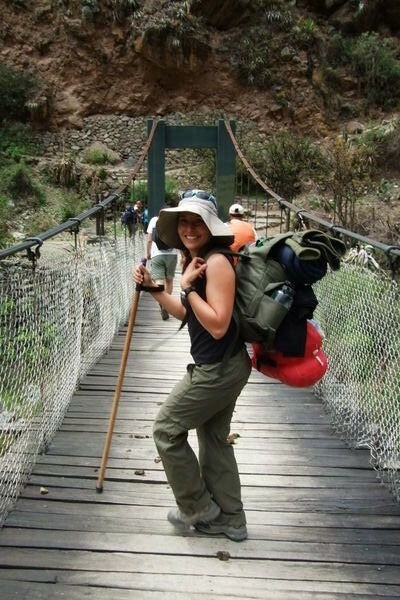 This enables us to offer you the best value for money and ensures success in gaining your trekking permit for the Inca Trail. When your deposit is received a trip booklet is sent out detailing every element of the trip. 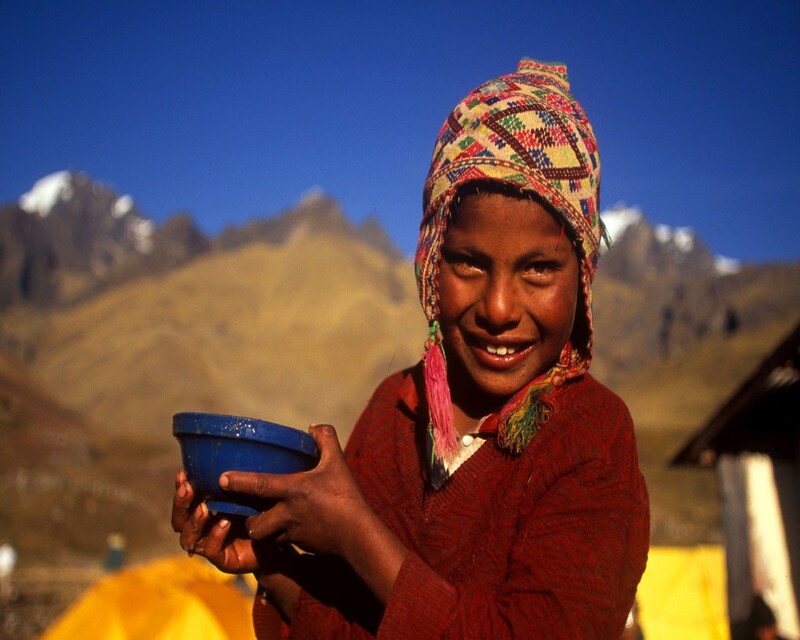 All our expeditions are ‘all inclusive’ this means that the cost covers all the accommodation, flights, transfers, guides, porters and cooks, group equipment + all food throughout your expedition. The price also covers the training weekend in the Forest of Dean. The only costs not included are travel insurance, tips, lunch, dinner and drinks in the Cusco (this gives you plenty of opportunity to explore the cities and eating out is very inexpensive).